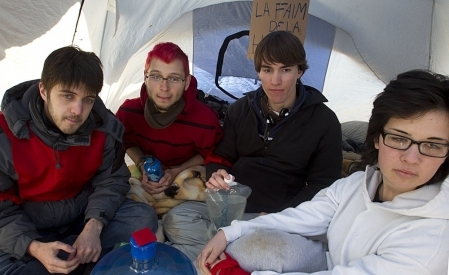 A group of four students has been at it since midnight Saturday morning, camping outside the education ministry's offices on Fullum St. in Montreal. Organizers say they want to point out that the cost of an education, including tuition fees, ancillary fees and other expenses, is forcing students to resort to food banks. They say the number of students in that position has tripled since 2008. 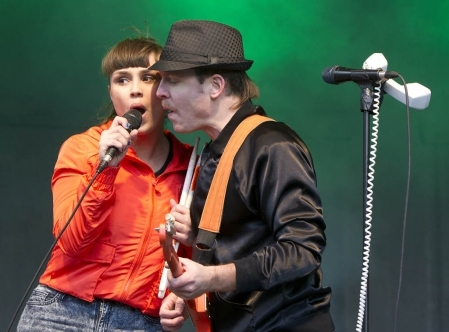 ..great video from the 29th. The most violent thing about today’s La Grande Mascarade protest against rising tuition was some intense glitter bombing. Around 1,500 student took to Montreal streets today clad in creative costumes ranging from telephone booths to sequined pink, in a Mardi Gras-esque parade. Divided into four groups, categorized by the colours that represent the metro lines, students followed routes through downtown Montreal which organizers had published prior to the event. Few riot cops were scattered around the roots, watching over the Champlain Bridge and Service de police de la Ville de Montréal headquarters. Ten stood guard outside Premier Jean Charest’s office where a group of Concordia dance students organized a giant red square made of protesters. The four groups reconvened at Place-des-Arts after three hours of protesting. Many moved to the L’Université du Québec à Montréal sciences building for some spirited speeches, dancing and the burning of a Charest effigy. The SPVM reported three arrests, all charged for mischief. google translation - Today, Monday, April 2, 2012, parents affiliated with the network of parents against the rise in the morning interrupted the presentation of Ministers Bolduc and Bachand's Hospital St. Mary's to express their solidarity with the student struggle in progress. Aujourd'hui, lundi 2 avril 2012, des parents affiliés au réseau des Parents contre la hausse ont interrompu en matinée la présentation des ministres Bolduc et Bachand à l'Hôpital St-Mary's pour exprimer leur solidarité avec la lutte étudiante en cours. Manifestation contre la hausse des frais de scolarité du gouvernement Charest. 600 personnes, principalement des Cégep de St-Félicien, de Jonquière, de Chicoutimi et d'Alma, ainsi que de l'UQAC, ont ainsi descendus dans la rue pour dénoncer cette mesure destructrice contre la société québécoise. Students are being so selfish. They are standing in the way of something so beautiful—Quebec becoming more like the rest of Canada. As everyone knows, students in the rest of Canada pay higher tuition and la belle province should catch up. Quebec has a history of looking over its shoulder when it comes to policy-making. There’s a reason no one’s ever called Quebec “a unique nation within Canada.” It’s because we are the tofu of Canada—we absorb the guiding principles of everyone else. On the heels of matching school funding with our neighbours, Quebec will finally be able to complete the rainbow connection in other financial matters. Charest is telling us that the government can’t make it work within the constraints of the current budget while citizens struggle to pay the exorbitant taxes imposed by his government. Where tuition is higher, taxes are lower. British Columbia’s income tax is 5.06 per cent for anyone earning $37,000 or less—in Quebec it’s 16 per cent. We also pay 9.975 per cent provincial sales tax, but in Alberta, they pay nothing at all. After tuition goes up, taxes wouldn’t need to go all the way down to the levels of other provinces; they would just need to move in that direction. Quebec would just be doing its fair share to compensate for axing our services. Students shouldn’t strike, or rally, or do anything beyond joining a Facebook group to stop this progress. It’s amazing how passionate they are, even though they clearly haven’t looked into it. Do your research, students! Other provinces pay more in tuition, so that means other provinces function better than ours. Look it up. We need to start aligning ourselves with the rest of Canada so we can start the shift away from being this outlier of a high-tax, high-service society, to the much more desirable low-tax, low-service society. Everyone having access to the same opportunities, regardless of what family they were born into or what lucky breaks they’ve had is so passé. 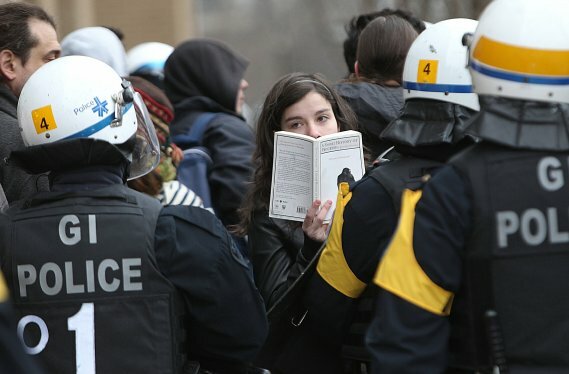 Using a cat-and-mouse strategy, a crowd of fleet-footed students opposed to planned university tuition hikes roved through downtown Montreal Wednesday morning – and, at one point using the subway, forced the cops into vigourous chase mode. "The demonstration is over," Montreal police tweeted at 9:30 a.m., roughly 90 minutes after it began. "There were at least 100" demonstrators who left the Eaton Centre using the McGill métro station, said Jean-Denis Séguin, stationed outside that subway entrance collecting funds for the Accueil Bonneau homeless shelter. "They went that way," he added, pointing to a sign indicating eastbound, but not before, with quick wit, he successfully solicited a $3 donation in return for the information. The subway-adept students apparently emerged, quickly, at the St. Laurent métro station and swung south. My take on why students should not have to pay for their education through tuition hikes. The legalization (unsatisfying translation of the French word « judiciarisation ») of the struggle is not losing any steam. The injunction motions are proliferating. We're fighting them as they come. Although the phenomenon is a cause of concern, the results haven't been too bad so far, with wins, narrow circumscription of the scope of the order when the injunction has been granted, and good ol' "keeping up the pressure sur le terrain". In the meantime: it is of fundamental importance to maintain pressure, as I just wrote. Strike mandates must be renewed ("La reconduction: la seule solution! "); actions must carry on. The struggle will be won in the streets, as always. ETA: meant to include a reference to this article in Le Devoir, which has a good summary on the main legal points. The legalization (unsatisfying translation of the French word « judiciarisation ») of the struggle is not losing any steam. I'd call it "lawyering up". And key dates are fast approaching for having to prolong semesters or worse. The Charest government must be panicking. They surely thought the struggle would peter out after March 22. As you said, the pressure needs to continue on the ground, and the fight will be won as always before, in the street. thread drift/ I support a hike in tuition. I do not support a hike in tuition fees./ end thread drift. How does it work in French, Unionist? "Charest, salaud, le peuple aura ta peau!" "On veut étudier, on n'veut pas s'endetter!" Crions, plus fort, pour que personne ne nous ignore! Banks get into trouble when they make bad loans. We insure banks against risk by creating a central bank and mandating it to be the lender of last resort to the banks. Note that in Canada our big banks received charters to operate from parliament. Thus, banks are publicly created, and publicly insured. Why should they not be publicly regulated, and controlled? Banks pay small amounts in interest to depositors, and then tax it back through outrageous service charges. Banks charge higher rates of interest on loans, and add service charges as well. The spread between the interest rate paid to depositors and the higher rate charged to borrowers adds to bank revenues. In theory, it is how they make their money, though exercising their power to tax through levying service charges represents a growing part of bank revenue. Our big five chartered banks made total profits of $22.4 billion in 2011. Thanks Duncan. Yes the banks are powerful. American Michael Hudson says it's a ripoff and that US banks have basically taken over federal powers of resource allocation. I think Canadian students are paying what are among, or perhaps even the highest interest rates in the world when it comes to student loans. It's ridiculous. I think it was you, Duncan, who said that Canadian governments finance student loans through the general bond market and costing them somewhere around 4%. Then they make loans to Canadian students at rates of anywhere from 8% to 11.5%. Apparently the feds are profiting from student loans as well as banks. Approximately 50 people were arrested following a demonstration that began early in the morning at Square Victoria and weaved its way through downtown Montreal on April 4. Among those arrested was Concordia University Television Program Director and cameraman Laith Marouf, who along with two other reporters was live-streaming the action. According to Freisinger, police became aggressive, hitting demonstrators with batons and using pepper spray on the crowd. There have been several reports of excessive violence used by police during this demonstration. One McGill student is currently hospitalized at L’Hôpital Notre-Dame after reportedly being struck by riot police. After leaving Square Victoria the demonstration entered both the Queen Elizabeth Hotel and the Eaton Centre. The Service de police de la Ville de Montréal has reported that pyrotechnic devices were used at both locations. The demonstration then took to McGill Metro and resurfaced at St. Laurent Metro, where police and riot police using the kettle tactic began breaking up the group and making arrests. As of 1:30 p.m. some of those arrested had started to be released. ..there's a video police report at the montreal gazzette. the cutv video puts a lie to that report. The police declared the demonstration as an "unlawful assembly" at about 11:30 this morning, and proceeded to arrest 71 people apparently under section 63 of the Criminal Code. Proverbially known as "reading the riot act". Some day these fascist thugs, and their bosses, will receive a fair trial for their crimes. A few days ago I heard an annoying 'off the cuff' remark on the telly - I think it was on CBC - to the extent that if Quebec can afford to have the lowest tuition fees in Canada, then it obviously doesn't need equalization payments. That comment is driving me nuts. What's a good response to it, other than ignoring it completely? That if some provinces can afford to give equalization payments, they should consider using some of that money to make post-secondary education more affordable for their own youth. If they run out of money to give Québec, that'll be just fine, because at least then they'll have spent their money the way we spend ours (at least, when we fight hard enough that the 1% give in) - on people. Sound twisted? I hope so - just like the original comment you heard! That's pretty good - wish I thought of it! But I've been preoccupied with other matters this week. "Public education is under attack around the world, and in response, student protests have recently been held in Britain, Canada, Chile, Taiwan and elsewhere..."
"Today we are witnessing an emerging massive global revolt, led primarily by the educated and unemployed youth of the world, against the institutionalized and established powers which seek to deprive them of a future worth living.."
"Teachers and future teachers against the hike!" Meanwhile, students at about 30 area high schools were welcomed by the sight of huge red placards on the fences and exterior walls of their schools. As we speak, Minister of Education Line Beauchamp is making some kind of announcement in the National Assembly about improving accessibility to education. All the buildup has indicated that it will be confined to the loans and bursaries program. That's not what the students want and it won't be enough to dampen the struggle. The government must come to the negotiating table and talk about tuition fees and the whole management of postsecondary funding. It amounts to more possibilities for students to go into debt. Not what they're looking for! And the piddling $21 million cost (over 5 years) of the expanded programs will be deducted from government financing of the universities! Basically, the Charest government has adopted the proposal of François Legault's CAQ party. They're no longer even capable of coming up with their own neoliberal ideas. The "Bureau du Québec" in Toronto was occupied today in solidarity with the Quebec student strike and to oppose the current level of tuition fees in Ontario. TORONTO - Le mécontentement à l'endroit de la hausse des droits de scolarité au Québec s'est transporté dans la Ville Reine, jeudi matin, alors qu'une quinzaine d'étudiants ont occupé les locaux du Bureau du Québec à Toronto pendant environ une heure. L'occupation du Groupe des étudiants québécois-ontariens pour la gratuité scolaire se voulait un geste de solidarité envers le mouvement de grève des étudiants au Québec. Al Jazeera employed something similar in its questioning of student leaders today,and not just a comparison across Canada...i.e. how can you complain when the average American student is paying fees of $20,000 and up. The student held her ground, insisting that it represented the difference in ACCESS to education that one expected in Canada. I should imagine that the same argument would apply in comparisons across provinces. Because tuition fees and need for equalization payments aren't correlated in any way? If tuition fees were an indicator of a need for equalization payments, then clearly Alberta needs equalization payments much more than Manitoba. Describing the province’s offer to make the repayment of student loans more flexible and extend credit to students whose family income is above $60,000 as “arrogant” and "insulting," the federations representing as many as 200,000 striking college and university students say they will only negotiate tuition and university funding as a common front. And representatives of the three federations who met with reporters Friday said they feel public opinion and the price tag they attach to their nine-week strike is pushing the Charest government into a corner. “We invite all of the students of Quebec to continue with the strike because we have the firm conviction that we’ve come to a crucial moment and that we’re closer than ever to victory,” said Léo Bureau-Blouin, head of Quebec Federation of College Students. Gabriel Nadeau-Dubois, spokesperson for CLASSE, an umbrella group uniting students groups, was more direct: “When you spit in the face of the student movement, the student union replies and replies loudly. ..they remain strong! bravo! i am with you in spirit! It was Gabriel Nadeau-Dubois who held firmly to the argument from need for greater equality of access to higher education in the face of comparisons by Al Jazeera with other provinces and with U.S.states. And she smiled into the camera throughout the interview. An inspiring leader. Another person interviewed, an academic, pointed out that Quebec is also 'naturally" closer to European expectations in this regard.The interview was a commendable example of what a news report should accomplish, not misleading in intent. Despite the Good Friday holiday, students didn't let up. 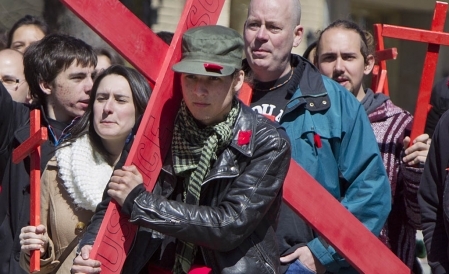 In Outremont, they conducted an "Educational Way of the Cross", stopping at Finance Minister Raymond Bachand's home and his constituency office. Occupying the Minister of Training, Colleges, and Universities' office. To mark the 52nd day of their strike - as many days as the record walkout of 2005 - and to denounce the Québec government's announcement concerning the loans program, students blocked the SAQ (Québec Liquor Corporation) distribution centre, symbolically broke glass [to condemn the "mediatization of violence"], and danced at an open-air concert. There appears to be no end in sight for what is now the longest strike in the history of the student movement in Quebec. After close to eight weeks, leaders of the protest against university tuition fee hikes appear more united, more defiant, and more combative than ever despite court injunctions ordering picket lines to be dismantled and a concession offer by the government on student loans. There are more rallies planned this week. With 175,000 students out of a province-wide total of more than 400,000 on strike, leaders of the protest movement are playing havoc with Premier Jean Charest’s pre-election strategy. Head & Hands envisions a society in which all youth are full participants inspired by the endless possibilities open to them. We write today in support of Quebec’s youth-led student movement for accessible education and affordable tuition. We stand in solidarity with the Coalition Large de l’Association pour une Solidarité Syndicale Étudiante (CLASSE) and other student organizers. We strongly support their mobilization for accessible education, and applaud their efforts to open larger discussions of social justice linked to the structure and function of post-secondary education in our society. Working to support youth on a daily basis, we experience the positive effects of accessible education and affirm its fundamental contribution to the well-being of our communities. We believe strongly in the power of politically engaged youth to create positive change in our societies, and recognize the tangible products of student strikes throughout decades past in Quebec. We hope this mobilization will extend to address the multiple systemic barriers that marginalize youth for reasons of race, class, status, ability, gender, or sexuality, among others. We warmly invite youth from the student movement to contact us for social counselling, legal information or advice, and medical support. All our services are free, confidential, and non-judgemental. We can be reached by phone at 514-481-0277, or in person at 5833 rue Sherbrooke Ouest. With no talks planned, Tuesday may mark a critical point in the nine-week-long strike that has polarized many campuses. The Fédération étudiante collégiale du Québec says that day is a kind of point of no return when CEGEPs will have to figure out how to make up lost time before June 15, which is as long as most college teachers have to work, contractually. In fact, a few CEGEPs - such as Collège Montmorency in Laval - have already had to cancel their summer sessions to accommodate the extended semester. Tuesday is also when the resolve of striking students at the Université de Montréal will really be tested, as the university sent out an email last week saying if students aren’t back in class by then, they can’t guarantee that all courses can be completed by June 15, the end of the extended semester. That means some classes could simply be suspended, as the university asserts there will be “no compromise” on the quality of the education. And this week is when many university and CÉGEP associations will have to renew their strike mandates - just as upheaval and uncertainty in the education system is swelling and the stakes are getting higher as final exams approach. Demo to last 12 hours: Wednesday will be another big day for protesting students as they launch a 12-hour-long demonstration that will begin at 7 a.m. at Victoria Square. The “unlimited protest” is supposed to show the students’ unlimited resolve in the face of tuition increases and the Quebec government’s unwavering stance on the issue. A continual loop of students will take turns marching for an hour at a time throughout the day. About 185,000 CEGEP and university students are boycotting classes over the Quebec government’s plan to raise university tuition rates by $325 a year for five years. Radio CKUT 90.3FM condemns the repressive actions of the police and university administrators in response to the Quebec student strike. Since the beginning of the student strike, university administrators as well as the police have used repressive tactics to silence student dissent. From locking-out students on strike, to injunctions, to banning student activists from campuses, to police brutality and arrests, university administrators and the police have made it clear that they will not tolerate political dissent, and the mass arrest of over 70 protesters at a Montreal protest against tuition hikes on April 4th , 2012 serves to prove that repression is on the rise. Freedom of the press is also under attack. Among the protesters arrested on April 4th, a CUTV producer, Laith Marouf, was arrested, while other members of his crew were intimidated and violently pushed by the police. University administrators are also infringing on the freedom of the press. McGill University has blocked campus access to external media during student protests, and has recently prescribed disciplinary charges on two McGill Daily reporters covering the James Administration Building occupation. As a campus-community based radio station, we must take a stand for freedom of the press, and against police brutality and political repression. Illegal arrests of members of the press cannot be tolerated. Journalists must feel safe to do their jobs, to report freely on public mobilizations without fear of university and police repression, or threat of arrest. It is a sad day for freedom of the press when members of student media are prevented from covering student events and detained. In addition, CKUT wholeheartedly supports the Quebec Student General Strike and its demands for accessible education. CKUT stands in solidarity with all student organizers and supporters engaged in this mobilization for social justice. We applaud the students’ tireless fight against one of many austerity measures that the Quebec Government is imposing on our society. As a campus-community radio station, we support the resistance against attempts to worsen students’ and community members’ living conditions. People’s Assembly – Grand rassemblement populaire: Vers un Printemps québécois! your family and friends…. this is the launch of our very own “Quebecois Spring”! See you there!! For over 6 weeks, hundreds of thousands of students are on an unlimited general strike against tuition fee hikes. We recognise that this decision has been made in a broader context of privatisation and commodification of public services and attacks on women’s well-being. On March 22nd, about 200, 000 people marched in the streets of Montreal. This mobilisation has proven to be unique in Quebec’s – and possibly – Canada’s history. In light of this massive mobilisation, during a congress held on March 24th and 25th , CLASSE student associations resolved to broaden and go beyond the student movement, calling for a “A quebecois spring”. We recognise that this call occurs in the context of unprecedented cases of corruption, furthering the agenda to exploit shale gas, imposing a health tax, and increasing tuition fees by Jean Charest’s liberal government. But the warmest applause seemed to be reserved for Gabriel Nadeau-Dubois, a spokesperson for CLASSE, an umbrella group student organizations, who told his audience that the past eight weeks had been a learning experience for those who marched. “We learned what justice was,” he said. “We learned what pepper spray is, we learned what tear gas smells like, but most of all, we learned what resistance is. “By the hundreds of thousands, we learned to fight, we learned to fight as we never have before ... They have harder nightsticks, they have thicker armour, they have the dumber newspapers and they have the thicker wallets. “But we have the courage of the oppressed and we have the strength of the multitude. 7 April 2012 — On Thursday 4 April Concordia’s Dean of Arts and Science Brian Lewis sent a message to department chairs outlining this Faculty’s response to student strikes at Concordia. In a word, that response is: Denial. Denial that students in some departments collectively decided not to attend up to 38.5% of their semester, denial of the standard practices of other Quebec universities, and denial that classes are an integral part of learning. The solutions presented to professors are unacceptable, limited to changing course requirements thus omitting class material, awarding Incomplete or In Progress marks, and submitting marks at a slightly later date. a commitment to exercising flexibility, so that these changes do not negatively affect students who are unable to return to classes or write exams at a later date. Many students have missed significant amounts of class time due to the strike. By refusing to arrange to reschedule class time or extend deadlines once the strikes end at Concordia, the Dean and the senior administrators are devaluing the quality of education at this university. Real learning cannot happen in isolation, without significant engagement and guidance from an instructor. To expect work to be handed in without this instruction is to say that these elements of education are dispensable, which is a disparagement to the profession of teaching. MONTREAL — There are ominous changes underway in governmental policy internationally which have resulted in tax cuts for corporations at the expense of essential public services. In Quebec, one of the focal points of the discussion surrounding the implication of austerity is the future of higher education, which has historically been protected and supported by popular movements. There is a strong social movement in Quebec opposing the government’s 2011 university funding plan, which includes increases in tuition of 75% and intensifies the shift in funding reliance to private sources through donations. The plan also promotes further marketing of research and increased partnerships with private entities to reach the funding goals listed. As is the case with most grassroots movements, information about this struggle does not seem to be travelling too far. This struggle has been making news for months in Quebec. In recent weeks the headlines have been multiplying as student groups have organized autonomous blockages and other economic disruptions. In the last week buildings housing the offices of Hydro-Quebec and the Liquor Board of Quebec, as well as multiple highways, the offices of the premier, and both the ministries of finance and education were all blockaded. The escalation of economically disruptive activities on the part of the activists has been in reaction to the stubborn refusal of the government to negotiate, or even consult, with student associations on the future of our education system. On March 22nd, close to 200,000 people took to the streets of Montreal. That march was a manifestation of the support for this movement across this province and around the world. There will be another "family" (all-ages) demo on the 14th, then a week later is Earth Day, with a mass demo planned. VIVE LES ETUDES LIBRES ! Quebec students aren't just fighting to hold the line on their tuitions, they are fighting austerity on behalf of the whole nation. The least we can all do is wear a scarlet square in solidarity. We hear a lot from Charest and conservative lobbyists about how tuition hikes are the only way to finance the Quebec University system, but they never seem to present any actual facts. Why? Because, as you can see, the facts speak for themselves! For sources and more information, visit gsaconcordia.ca. The Graduate Students' Association of Concordia University represents 6000 master's, doctoral, and diploma students. With research from Free Education Montreal (freeeducationmontreal.org), script and video work by AJ Korkidakis. A variety of fleet-footed groups of protesters moved quickly through such diverse locations as the main campus of McGill University near Mount Royal and the World Trade Centre in Old Montreal. Other targets included the head office of the National Bank of Canada, where protesters blockaded all entrances for about an hour before Montreal police deployed what they termed "chemical irritants" to disperse them, allowing bank employees and others to get into work about 9 a.m. The protesters were ramping up pressure in what has already become the longest student strike in Quebec history. Their goal is to turn back university-level tuition increases planned by the Quebec government. Other groups of students proved active on the north end of Montreal Island. Among their actions was a rush-hour blockade of the Viau Bridge, linking the island with Laval. That protest, during the morning inbound commuter rush, triggered traffic chaos. The all-day plan for the protest marathon — which organizers said would last from 7 a.m. to 7 p.m. — includes hourly march departures from Victoria Square. Protesters also ran through The Bay department store downtown, then converged shortly before noon in front of the Loto Quebec offices near McGill University. That building was the site of an earlier protest where one student sustained an eye injury, apparently caused by a stun grenade used by police. MONTREAL, April 11, 2012 — After weeks of being stonewalled by Concordia administration, students are publicly denouncing the University’s lack of academic integrity and its denial of Quebec’s tradition of student strikes. Today, with support from CLASSE spokespeople, students on strike at Concordia are outlining their demands. Concordia University has provided no suitable solution for making up lost classes, despite the success of various strategies employed by other Quebec universities in response to the current strike. An April 4 statement released by Dean of Arts and Sciences Brian Lewis restates the administration’s position of denial and proposes inconsiderate and inadequate measures to address lost class time and to salvage Concordia’s academic integrity. The Graduate Student Association’s Strike Committee, along with various undergraduate student associations involved in the strike, condemn the administration’s irresponsible position. They demand that Concordia University administration recognize the collective decision of students with a strike mandate, and that it propose immediate solutions allowing students and faculty to make up for lost time once the strike is over. Since the beginning of the student protest, the university has had its head in the sand, denying the strike mandates — dating as early as March 5 — adopted by numerous departments, many of which are members of the CLASSE (Coalition large de l’association pour une solidarité syndicale étudiante). “CLASSE is proud to count the departmental student associations at Concordia as members,” says Jeanne Reynolds, spokesperson for the province-wide student coalition for the strike. Concordia students and CLASSE spokespeople will be available to the media on Wednesday, April 11, at 10:30AM on the 7th floor of the Hall Building, 1455 de Maisonneuve West. Valleyfield CÉGEP administration had decreed a return to class today, notwithstanding another majority vote to extend the strike mandate. Hundreds of students picketed and blocked entry, supported by delegations of teachers and parents. The administration has now cancelled classes for the day - although they say they'll try again tomorrow, or Monday, etc. One day at a time until final victory!